During 2016 the School of Engineering will celebrate the 60th anniversary of its founding. From humble beginnings in 1956 when 64 students enrolled, the previous Faculty of Engineering and the present School of Engineering have experienced remarkable growth and development. In 1971 it became the largest faculty of engineering in the country. Presently, with registrations of approximately 5 700 undergraduate and 1 500 postgraduate students, it is cited in the International Science Index as among the top 1% of engineering schools worldwide. The remarkable achievements of the School will be celebrated with great pride during 2016. During the anniversary year a celebration programme will be presented with the purpose of honouring the founders of the Faculty, reflection on our outstanding achievements and milestones, acknowledgement of our supporters and sponsors, and drawing inspiration and motivation for the future advancement of the School. Click here to read interactive eBook. The anniversary programme will kick off in the first semester with an anniversary dinner in March at the Rautenbach Hall. In May an anniversary concert will take place in the Aula (this will substitute the traditional annual EBIT concert). An anniversary booklet will be published in hard copy and electronic format for distribution among interested parties throughout the year. At the start of the second semester a visitor’s day will be held for invited grade 11 learners and school principals from 50 selected secondary schools in the northern provinces. The programme will comprise a tour of the School of Engineering’s facilities, an information session and a reception in the Rautenbach Hall. At a later date in the second semester, the annual prestige Hendrik van der Bijl Lecture will be presented. The lecture will focus on the anniversary year. During the anniversary year each of academic department in the School will present a special event for invited alumni, supporters and representatives of sponsors of the department. The proceedings will comprise items such as a tour of the departmental and other facilities in the School, an information session and a reception. 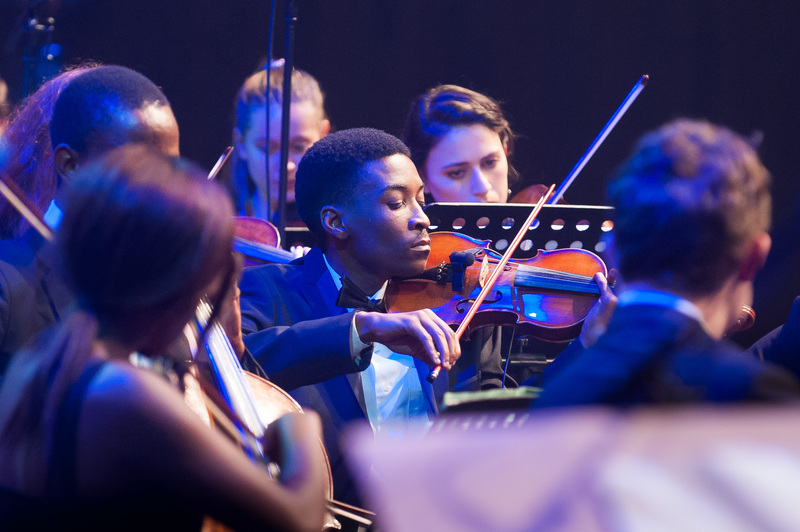 On Friday 20 May we celebrated the School of Engineering’s 60th anniversary as the evening air was filled with medleys and memories brought to us by the UP Symphony Orchestra conducted by Mr Gerben Grooten. A special effort was made to contact and invite as many as possible of our alumna from the four EBIT schools to attend this event and to share in the celebration of our achievements. We take pride in our thousands of alumna for their contributions to society in this country and also elsewhere across the globe. 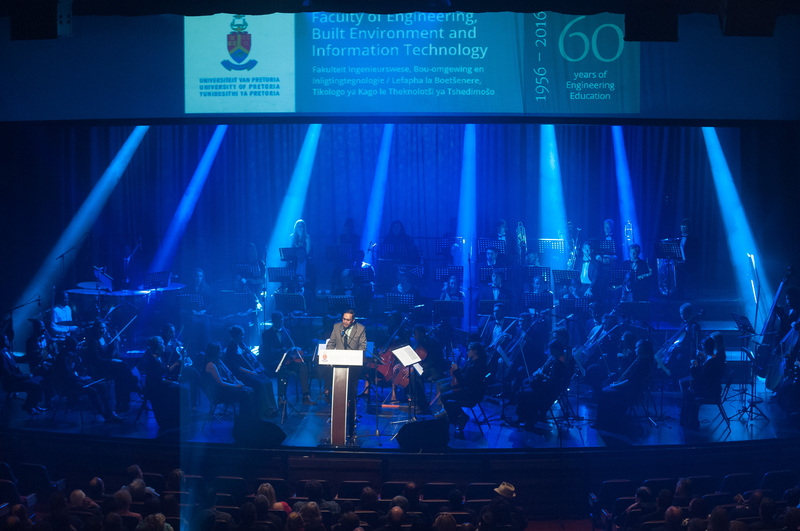 In the words of Prof Sunil Maharaj, the Dean of the Faculty of Engineering, Built Environment and Information Technology, “It is through your efforts, affiliation and involvement that we can together, proudly celebrate 60 years of Engineering education at UP”. The repertoire of the evening included “Libertango” composed by Astor Piazzola, Beethoven’s 5 Secrets and Johann Strauss’s “Pizzicato polka”. The vocalists, Ms Monica Mhangwana and Mr Mzwandile Mabuza, had the audience in the palms of their hands with their delivery of The Prayer. A moment of silence followed their last notes as the audience tried to soak up all of the emotion and then a never ending applause followed which was a testimony of their appreciation. It was a privilege to witness the genius of Mr Gerben Grooten. He not only conducted the UP Symphony Orchestra, but also engaged with the audience in such a way that the audience was drawn into the music as if they themselves were members of the orchestra. The programme was concluded with the masterpiece “World in Union” which brought a sense of loyalty and hope. The audience was taken through a journey of time and sounds and each one could identify with a particular song or sound. Together, all our different sounds and songs resonates in harmony, because we all believe that innovation will bring about change. Change does ignite hope within us – and hope is what our legacy is built on. Your footsteps are our legacy and we will continue to build this legacy. Thank you for sharing this special celebration with us. 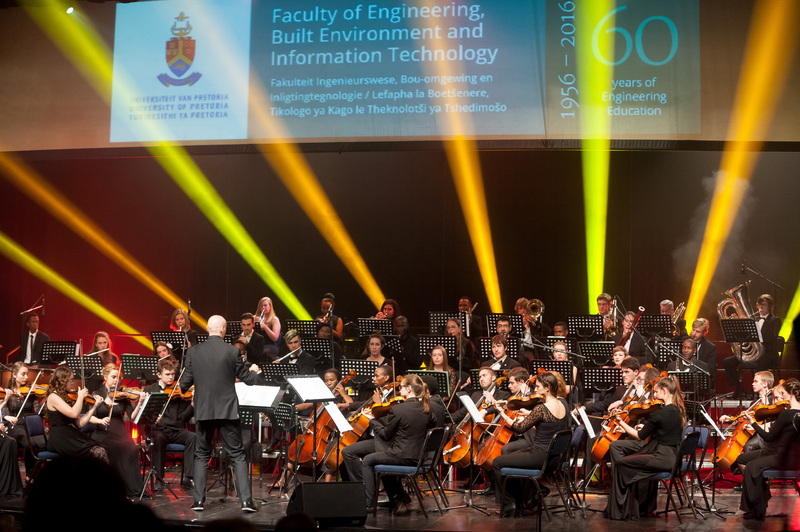 The celebrations of the School of Engineering's 60th anniversary got off to a memorable start with a gala dinner held in the Rautenbach Hall on Saturday, March 12. Read more about the event in this article.